Map Generator better than ever! Design beautiful map interfaces, mobile applications and more in less time with Map Generator 3.0. Now powered by Google and Mapbox. Create a shape and select it. Choose the location, styling and zoom. Voila! Your shape will be filled with a map. 🔥 Map preview! Now you can see a live preview before generating a map. 📍 You can move the map preview, drag a pin to pick a location and change the zoom with no effort. You can still change the address settings as before if you wish. 💅🏼 A whole new UI. Thanks to Guillermo for the logo! 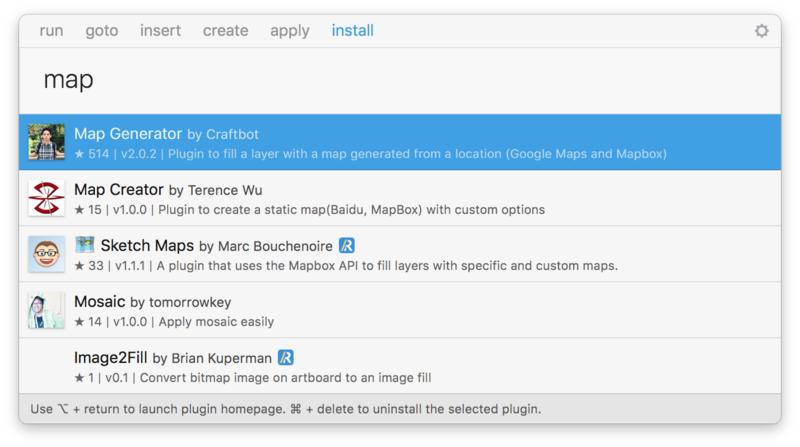 With Sketch Runner, just go to the install command and search for Map Generator. Runner allows you to manage plugins and do much more to speed up your workflow in Sketch. Download Runner here. The plugin is compatible with Sketch 4+. If you have any questions or troubles with our product, please feel free to open an issue here. eddiesigner published this plugin 2y ago.